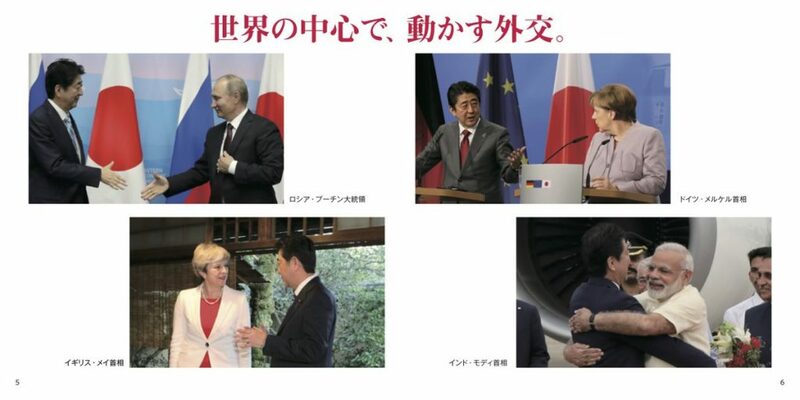 Japanese Prime Minister Shinzo Abe is pictured with world leaders in the LDP’s manifesto (pictured above and below). With four days until the campaign for Japan’s October 22 general election officially begins, the outlook for the vote is still extremely fluid. Polls show significant numbers of undecided voters—nearly 43% in Kyodo News’s latest tracking poll said they have not yet decided which party to support in the proportional representation (PR) voting bloc—but they also suggest that Tokyo Governor Yuriko Koike’s newly formed Party of Hope is struggling to connect with independent voters. Koike and her allies are clearly trying to replicate former Prime Minister Junichiro Koizumi’s 2005 electoral victory and the Democratic Party of Japan’s (DPJ) 2009 electoral victory, wins that depended on bringing out independents to swell vote totals. Many of those independents stayed home in 2012, when turnout reached a postwar record low of 59.32%, and in 2014, when turnout set another record by plummeting even further to 52.66%, enabling Prime Minister Shinzo Abe’s Liberal Democratic Party (LDP) to win comfortably in both elections. The Party of Hope is trying to use a mix of Koike’s personal popularity, which led to a significant LDP defeat in the July Tokyo metropolitan assembly elections; greater party discipline and policy coherence, hence the party’s decision to force ex-Democratic Party (DP) candidates to sign a statement of principles; and populist proposals like eliminating nuclear power and scrapping the October 2019 consumption tax increase, which could also serve to draw a contrast between the Party of Hope and the LDP since their approaches to other issues—constitutional revision and national security especially—are so similar. While initial polls after the Party of Hope was announced on September 25 suggested that Koike’s new party could pose a significant challenge to Abe, subsequent polls suggest that voters are skeptical of the new opposition party. For example, in the Asahi Shimbun poll conducted on October 3-4, 50% said they were not optimistic about the party, an increase of eleven points from the previous week, while 35% said they were optimistic, a ten-point decrease. In polls of voting intentions, meanwhile, the Party of Hope’s support has fallen off from the 18% support rate it received in the Mainichi Shimbun poll conducted September 26-27 and 19% rate in the September 28-29 Yomiuri Shimbun poll, which suggested the possibility of a surge in favor of the new party. Since those polls, however, the Party of Hope’s support for PR voting has been below 15%, reaching 14.8% in the Kyodo September 30-October 1 poll and only 12% in Asahi’s latest. What matters is the trend, which suggests that over its first ten days the Party of Hope does not appear to have attracted the support of independents. The chaotic rollout of the new party is likely a major factor in accounting for the cool response from the electorate. The announcement that the DP would withdraw its endorsements from its candidates and encourage them to apply to run as Hope candidates—provided that they satisfied Koike’s conditions—was controversial within the DP and led to the creation of yet another new party, the Constitutional Democratic Party of Japan (CDPJ), by ex-DP members who were orphaned by Koike’s rejection of the DP’s liberal wing. While Asahi found that the public did not necessarily disapprove of the imposition of conditions on prospective candidates (53% said it was appropriate, 25% said it was not), Kyodo found that 62.3% of respondents disapproved of the merger, with only 28.1% approving. This data point suggests that voters could agree with the argument made by Abe and other ruling party lawmakers that the Party of Hope is just the old DP with a new name in time for the election. Given the DP’s inability to regain the support of independents after 2012, the extent to which independent voters believe that the new party is insufficiently distinct from the DP could hinder its chances. What is also clear is that voters do not want Koike to leave the governorship and run for the House of Representatives—in Asahi’s latest, only 9% said she should run, while 79% said she should remain as governor—meaning that Koike would not be in a position to serve as prime minister if the Party of Hope were to form a government, and implying that the party needs to signal to voters who its preferred candidate for the premiership would be if it did form a government. As the party addresses these concerns, finalizes its candidate list, and drafts its manifesto, the party may have a better chance of appealing to independents, but as things stand there is little reason to anticipate a Party of Hope boom. It is possible that voters are more interested in this year’s election than in the 2014 general election, suggesting a potential increase in turnout. For example, in November 2014, the Asahi Shimbun found that 65% of voters were either greatly (21%) or somewhat (44%) interested in the election. In NHK in November 2014, 73% were either greatly (23%) or somewhat (50%) interested in the election. By comparison in Asahi’s latest poll, 70% said they were greatly (29%) or somewhat (41%) interested. NHK also found more intense interest, with 32% saying that they are greatly interested and 43% saying somewhat interested. Kyodo also found a 9% increase in interest compared to 2014, to 79.5%. NHK however, found that the share of respondents who said they will definitely vote was lower than in 2014, 53% versus 57%, with only a tiny increase in the number of voters who say they will probably vote, 30% versus 29%. In short, it is not clear that “interest” will translate into higher turnout. Another factor that could influence turnout is the CDPJ, headed Yukio Edano, best known as the face of the Japanese government during the 3-11 triple disaster. The CDPJ was only created on Monday, October 2, so little polling has been conducted that asks about its support. In the Asahi Shimbun poll conducted after the CDPJ’s creation was announced, the new party polled 7% in PR support and 4% in single-member districts (SMDs). As suggested by the sharp increase in the CDPJ’s Twitter following, which has surpassed not just the Party of Hope but also the LDP, there is clearly interest in the new center-left party. But its ceiling will be limited by the number of candidates it is able to field—substantially more former DP candidates have joined the Party of Hope rather than the CDPJ—and by its ability to coordinate candidate selection with the Japanese Communist Party (JCP) in SMDs. Nevertheless, the prospect of a center-left party committed to opposing the LDP unambiguously could help drive up turnout. Amidst the frenzied activity among the opposition parties, the LDP and Komeito are prepared to appeal to voters on the basis of a strong economy, adroit management of foreign and security policy, and political stability. While the Abe cabinet’s approval ratings fell into negative territory after Abe announced the dissolution—which may reflect disapproval of his decision to call an election—in the latest Asahi poll the cabinet’s approval rating rose to 40% versus 38% disapproval. Despite concerns about a Koike boom, polls suggest that conditions may still favor a strong performance by the LDP, strong enough to win a third term as LDP president for Abe. For example, in that Asahi poll the LDP drew 31% support in the PR bloc (it received 33.11% of the PR vote in 2014) and 35% in SMD voting (compared with 48.1% in 2014). While significant numbers of undecided voters in both categories—27% and 44% respectively—could signal LDP vulnerability, it is far from certain that the bulk of undecided voters will vote against the LDP or turn out to vote at all. Polls suggest that the Abe government’s platform is not necessarily unpopular, potentially blunting the appeal of the Party of Hope’s populism. For example, polls show that majorities generally support Abe’s plan to raise the consumption tax from 8% to 10% in October 2019, but to redirect some of the revenues from deficit reduction to education, thereby countering the appeal of Hope’s promise to freeze the consumption tax rate. In NHK, the public favored this approach by 50% to 44% and in Asahi 42% to 40%. In Yomiuri, support was only 27%, but an additional 36% favored raising the tax and using the revenues as originally intended. Abe could also be helped by relatively strong public interest in foreign policy as a campaign issue. The prime minister’s management of the North Korea crisis continues to receive high marks: 57% approval to 29% disapproval in Asahi. In last week’s Yomiuri poll, meanwhile, 64% said “foreign and security policy issues like the North Korea problem” would be of particular importance as they decide how to vote, higher than any other issue, including social security (58%). 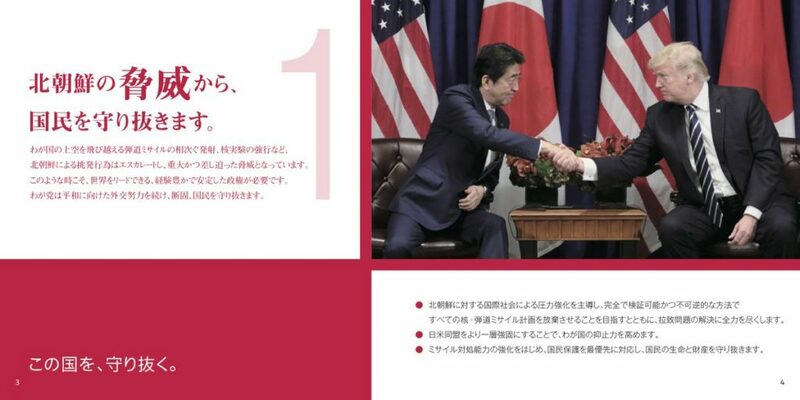 Not surprisingly, the LDP’s manifesto, released earlier this week, emphasized the North Korea threat and highlighted Abe’s status as a global statesman more broadly. Finally, it is unclear just how much the Moritomo and Kake Gakuen will hurt Abe during this month’s campaign. For example, Asahi found that 41% would stress the scandals when making their selection, but 49% said that they would not. It is difficult to say from this data point whether anger at Abe’s scandals will be sufficient to boost turnout in favor of the new opposition parties, but at this point it seems unlikely. There is still time for the opposition to make inroads against Abe and the LDP this month, but the polling suggests it will not necessarily be as easy as it appeared when Koike announced that she would personally lead the Party of Hope. The LDP could still suffer some losses, particularly in Tokyo and the greater Kanto region, but it is unclear whether the opposition parties will be able to overcome lingering public doubts about their efficacy and leverage public dissatisfaction with Abe’s leadership to deal the prime minister a significant personal defeat, let alone unseat the LDP-Komeito coalition.